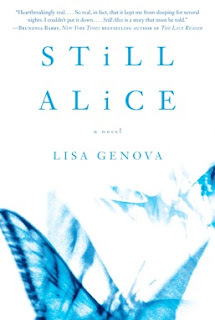 Still Alice By Lisa Genova Dr. Alice Howland is a psychology linguistics professor at Harvard. She is married to John, a scientist at Harvard and they have three healthy successful grown children. Alice becomes forgetful but is reassured by her physician that as a 50 yr old woman under a lot of stress and most probably going through menopause, this appears to be normal. The memory lapses become worse. At first Alice thinks she is going crazy, words sometimes do not connect, items misplaced. When she is jogging near her home of 25 years, she gets lost and that is the end of her life as she knows it. Alice suffers from early onset Alzheimer's Disease. This novel is told by Alice. It is mesmerizing, watching the train wreck of this incurable, horrible disease wretch away Alice's life. As painful as it is to watch, the reader cannot put this book down. If you do not know anything about this disease, you need to read this. If you know everything about this disease, you need to read this, so maybe you will understand a little better those who cannot. Just finished reading this great novel. It certainly reveals how one's life can be destroyed by this horrible disease. I personally know someone who is going through this now and many of the situations are the same.We need to appreciate each and every day of our lives. The statement, "live each day as if it were the last." is very true.